A cut out of a gingerbread man is seen to be standing on the magician's table. He is holding an inflated balloon. The magician tells the story of how the Gingerbread Man lost his head. During this story, the magician removes the gingerbread man's head and puts it inside a hanky held at the corners like a bag. When the hanky is opened, it is found to be empty! He asks the children what can be put instead of his head so that he looks ok. Some one will suggest the balloon. The performer takes the balloon and puts it in place of the gingerbread man's head. He also draws eyes, nose, etc. on the balloon to look like a gingerbread man's head. But the gingerbread man was very unhappy without his head. He wants the magician to do something to make him happy again. The performer makes some magical gestures and immediately the balloon bursts and the gingerbread man's head has come back! This is a fantastic children's magic if presented properly. 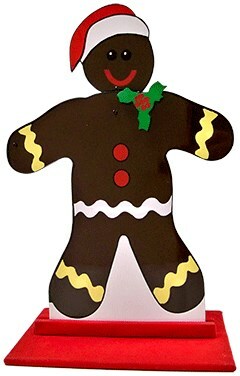 Includes a colorfully painted wooden Gingerbread man, a base stand, extra gingerbread man head and instruction sheet. NOTE: The Devil's Hanky mentioned in the instructions is not included.